Two days before Christmas, Earl Larocque stepped through the roof of a Colchester trailer home while shoveling snow off the building. The trailer's occupants, Larocque's mother and her husband, Charlene and Joseph Lucia, are both 72 years old and living on fixed incomes. Faced with a $4800 repair bill, Charlene had an idea. "I called the Free Press," she recalls, and told a reporter that she had "a hole in my roof and no money to fix it." The Burlington Free Press' Matt Sutkoski documented the couple's plight on January 11, explaining that various federal and state aid programs were not available to the Lucias. The following morning, the Free Press reported that an "army" of volunteers had mobilized to repair the roof. That prompted a glowing editorial, three days later, celebrating how ordinary Vermonters "helped make this a better place to live." The community response was heartwarming, but the Lucias may not be the innocent victims the media coverage made them out to be. For one thing, the Lucia's trailer was for sale when Charlene's son stepped through its roof - a fact Sutkoski was aware of but chose not to report. "All along, they wanted to sell the trailer, as I understand it," he said. "But they couldn't sell it because the roof was bad." Dan Buno, an agent with Colchester-based InPark Mobile Home Resales, said that when the roof failed, he advised the couple to remove the "For Sale" sign and contact the Champlain Valley Office of Economic Opportunity's weatherization program. In his first piece, Sutkoski reported that CVOEO Executive Director Tim Searles and Mary Ellen Mendl of the United Way's 211 help line "urged" the Lucias to "keep trying to find help." On Feb. 8, three weeks after volunteers installed the new roof, the trailer sold for about $35,000, according to Buno. The new owner, who asked that his name not be used, said when he learned the trailer had been the subject of Free Press news stories, he contacted Buno, thinking it odd that the place was back on the market so soon after all the publicity. "I called him up and said, 'How extensive was the damage, and did they replace the plywood?' 'Cause when I drove through here, all I saw was that the road was blocked. He said, 'No, there has been no serious damage.'" Charlene explained, "When the roof got fixed we decided . . . to get out of there, because we didn't have the kind of money it would take for upkeep." Although she uses the pronoun "we," it's not clear whether Charlene and Joseph were living together at the time of the roof incident - or whether the trailer was their only housing option. According to documents on file at Vermont Family Court, Joseph filed for divorce in May 2006, after three years of marriage. 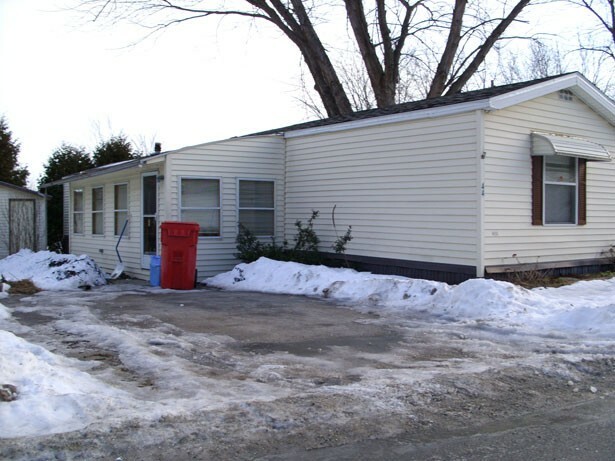 At the time, Joseph was living in the trailer; Charlene had an apartment at 3 Cathedral Square, a federally subsidized apartment complex in Burlington. One hundred of the complex's 108 apartments rent to tenants eligible for Section 8 housing assistance. The very next month, Charlene filed an affidavit, requesting that the court require Joseph to pay her legal fees. In the affidavit, she stated that Joseph Lucia had "adequate income and resources," including a $25,000 certificate of deposit, $10,000 in a savings account and $1539 a month in Social Security and pension benefits. Shortly after that, the couple apparently attempted to reconcile, but in August 2006, Joseph filed a motion, asking the court to remove Charlene from the "marital home" and back into her Cathedral Square apartment. The divorce was finalized on November 29, 2006, after which Charlene filed paperwork indicating she would appeal the family court's judgment with the Supreme Court of Vermont. She changed her mind in January - and so did Joseph. The couple remarried on January 17, 2007. But that union didn't take, either. Joseph filed for divorce again four months later. His complaint states that the couple had lived apart for six months, and that Charlene still resided in Burlington. It's unclear where Joseph and Charlene are now living, or whether they're together or apart. Reached by phone, Charlene would not disclose her current address. Nancy Eldridge, executive director of Cathedral Square Corporation, declined to confirm or deny that Charlene is still living in the Burlington apartment complex. Eldridge did say Cathedral Square has a waiting list of more than 750 people, and that the current wait for senior housing is about one to two years.